It’s freezing, but boys just want to wear shorts! Should you let them? Editor’s note: This story was originally published Jan.14, 2015 on TODAY.com. We update it and re-publish it every year, around the time we find ourselves saying “seriously, your knees are going to FREEZE OFF” to our children. Whether it’s a balmy 80 degrees or a frigid 5, some boys insist on wearing shorts. If Cara Schultz allowed it, her 10-year-old son Sam would wear shorts 24/7. Even if temperatures dip below the 10 degree mark in Pittsburgh, Sam will beg Schultz to wear shorts for ice-skating. Schultz offered a compromise: He could wear athletic leggings underneath. Sam balked. “He said he would rather wear pants,” she says. He simply doesn’t like the look of leggings and shorts. While he wears shorts for style, he also thinks they are more comfortable. Schultz certainly isn’t alone. Alisa Schindler chronicled her own struggles with her sons wearing shorts in the winter in The Washington Post. “That’s right, no matter what the weather, my boys are in shorts. Yup, it’s a balmy 26 degrees this morning, definitely shorts weather,” she wrote. 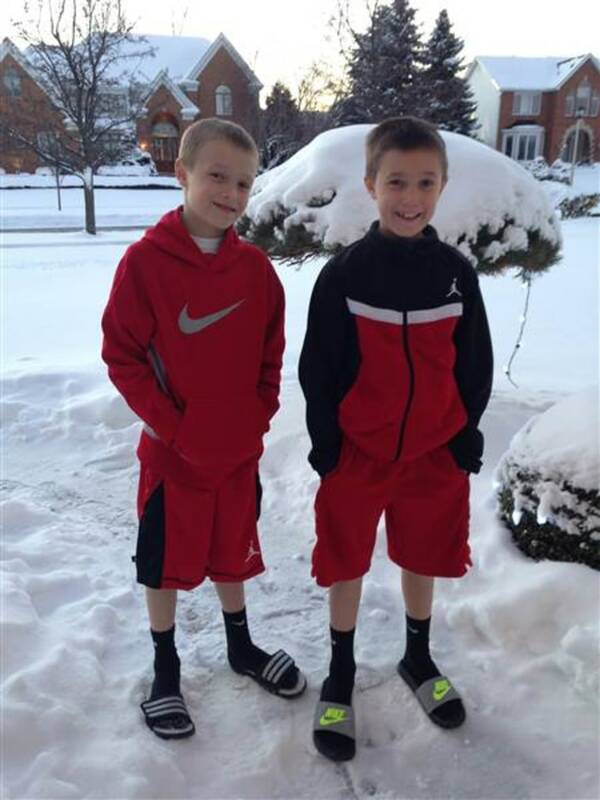 Susan Corcoran’s twin 8-year-old boys Cameron and Colin wear shorts through the cold, snowy Buffalo winters. They immediately change into shorts when they get home from school. They’d wear shorts to school if they could, but the uniforms mandate pants. They say they’re hot and shorts keep them comfortable, but Corcoran suspects another reason. “My husband wears shorts all the time. I think they are kind of copying his behavior,” she says. Parenting expert Dr. Deborah Gilboa says some children, boys especially, feel warmer. Her winter clothing guidelines: No shorts or light jackets when the temperature is dangerously cold. On moderate days, she won’t insist her kids wear pants. She wants them to make their own choices and she’s found that after a few cold days in shorts, they wear pants without being prompted. Dr. Elaine Schulte, chair of general pediatrics at Cleveland Clinic Children’s Hospital, takes a more hard line: She thinks parents should make their children wear pants in cold weather, despite protests, at least until the teen years. The temperature at which someone develops frostbite or hypothermia differs, Schulte says. It depends on whether there is rain or snow, how much muscle and fat the child has, what his metabolism is like, and how much of the body is exposed. “There is not an exact [temperature]. I think we just have to use our common sense,” she says. Schulte hasn’t treated any children who have developed frostbite or hypothermia from wearing shorts in the winter, but she does see children with frostbite from skiing. They are often well covered, but because they were out for such long periods of time, they suffered frostbite. Long-time exposure could make wearing shorts a danger. A walk to the mailbox is probably fine, while playing outside in shorts on a snowy day could be a problem. Even though it’s hard to pinpoint an exact dangerous temperature, adults can become hypothermic at temperatures as high as 40 degrees if also wet.